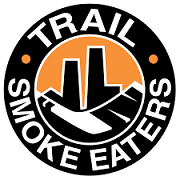 The Trail Smoke Eaters string of dismal results continued versus Cowichan Valley in a 6-4 road loss. The game started off promising for the visitors but an early 1-0 lead evaporated on three straight Caps tallies. Trail also coughed up bunches of late goals in Friday’s 5-2 loss to Victoria. With the weekend defeats, the Smokies now sit in last place in the Interior Divison.